Already have Movavi Screen Recorder Studio 9 or earlier? New name. Look for Movavi Screen Recorder Studio now. Set the default format in which to save your screenshots: JPEG, PNG, or any other. Improved capture quality: the default recording format is now the latest MKV! Good news for YouTube fans: now you don’t need to adjust the capture frame manually while recording YouTube clips. Just open the Capture Area and pick one of the ready-made YouTube size presets. New output format: Make viral GIF web bombs with Movavi Screen Capture! New Details option in the My files panel: organize your files using the smart table! New special effects: Camera Shake, Pan and Zoom, Retro, 70s, Color Brush. New export option – ‘Save as audio file’. "New" label highlights all recently added effects and transitions. Demo preview of animated effects. Video length displayed in Storyboard mode. New effects, titles and transitions for your video. Useful tips and links to detailed how-to instructions for the Titles, Effects, and Transitions collections. Support for PNG images with transparent background. Adding logos and new details to your video has never been easier! Improved video splitting tool. Now you can mark the unwanted parts of your video when watching it. 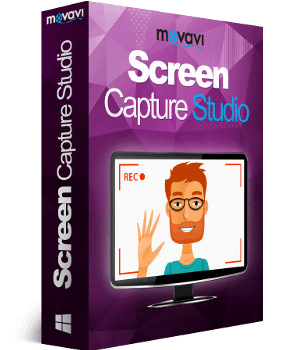 Movavi brings you a comprehensive screencasting toolkit that has everything you need for PC screen recording and editing. Capture your screen the way you want thanks to the clear intuitive interface, then edit your recordings to turn them into complete video clips with titles, transitions, and additional audio tracks.